Does Israel Need Think Tanks? Think tanks may once have been a solely American phenomenon, but they have now begun to take root in many countries, including Israel. In the United States, think tanks are immensely influential. Prominent examples, such as the Heritage Institute, Hoover Institution, American Enterprise Institute (AEI), and Brookings Institution, among other things serve as personnel resources for new administrations and their impact on policy is pronounced. In Iraq, for example, the Baker-Hamilton Commission, sponsored jointly by the U.S. Institute for Peace, the Center for the Study of the Presidency, and the James A. Baker III Institute for Public Policy, on the one hand, and the American Enterprise Institute's "Choosing Victory," which led to the surge, on the other, helped define the U.S. debate. In Israel, however, think tanks have failed to influence policy significantly despite Israel's democratic culture, the gravity of its policy debates, and the fact that, per capita, Israel actually has a higher percentage of think tanks than the United States. The think tank phenomenon in the United States began in 1916 when Robert S. Brookings assembled a group of political reformers to found the Institute for Government Research, which merged in 1927 with two sister organizations to found the Brookings Institution. Today, there are more than 1,400 think tanks in the United States, which include all institutions that research, analyze, and propose recommendations to policymakers and the public concerning domestic or international public policy. As policy research institutes investigating any number of foreign policy and domestic political issues, think tanks range in size from one-man operations like the Institute for Research-Middle East Policy (IRMEP) to institutes like RAND, which employs over 1,500 people. The most prominent American think tanks—the American Enterprise Institute, Brookings, the Center for Strategic and International Studies, the Council on Foreign Relations—may lean to the right or left but remain independent of any political party. Others, such as the Center for American Progress or Heritage, are in both reality and practice more closely, if not directly, linked to political parties. U.S. think tanks also vary in their level and type of funding. Some, such as AEI and the Washington Institute for Near East Policy, remain independent of government money and rely on foundation and individual donor support. Others, such as RAND and the Center for Strategic and International Studies, perform contract research for the U.S. government. On the far end of the spectrum, the U.S. Institute for Peace and the Woodrow Wilson International Center for Scholars accept the bulk of their budgets from the U.S. government. In 2005, for example, Congress provided $100 million to the U.S. Institute of Peace for a new building on the Washington Mall. As freedom and democracy have spread, so too have think tanks. There are now more than 5,000 internationally: 1,873 in the United States and Canada; 1,187 in Western Europe; 480 in Eastern Europe; 462 in Latin America; 548 in South and East Asia; 265 in Africa; 32 in Australia and New Zealand; and 188 in the Middle East. Of those in the Middle East, Israel is home to 35; 19 are in Turkey, and the Palestinian Authority hosts 17. Only six other Middle East or North African states have think tanks numbering in the double digits. Israel's thirty-five think tanks range from the well-established and -endowed Van Leer Institute, with its focus on secular and social issues, to the relatively young Reut Institute, which examines security and socioeconomic topics. 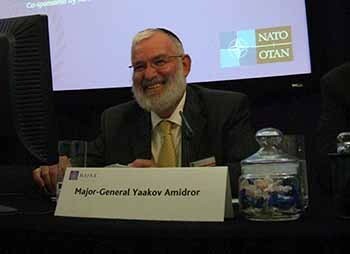 Many think tanks are affiliated with academic institutions, including the Institute for National Security Studies, which incorporated the older Jaffee Center for Strategic Studies at Tel Aviv University, the Begin-Sadat (BESA) Center for Strategic Studies at Bar-Ilan University, and The Global Research in International Affairs Center affiliated with the Lauder School of Government and Diplomacy of the Interdisciplinary Center, all of which focus on national security and Middle East affairs. Others, such as the Jewish People Policy Planning Institute and the Shalem Center, are specifically dedicated to issues relating to Jewry in Israel. Three factors helped smooth Israel's introduction to think tanks. The first is what Benjamin Balint, a fellow at the Van Leer Jerusalem Institute and former associate editor of the Shalem Center's quarterly Azure, describes as Israel's "Western political culture." The second is Israelis' familiarity with American political life, which is linked to the third factor: the high numbers of Israelis who have lived and studied in the United States. Indeed, Balint argues, most Israeli think tank founders "are very well connected with the States because they were either educated there or lived there." Still, familiarity with Western political life alone cannot account for the proliferation of Israeli research centers. After all, elsewhere in the Middle East, exposure to U.S. political norms has not translated into the establishment of think tanks. "If you're living in Jordan, in the Hashemite elite, you come back from time in the States to work in government, to be an advisor. You do not start a think tank because there's no political space for it," says Balint. In sharp contrast to most Arab states, Israel's political climate and governmental structures possess the necessary preconditions for carrying out independent policy analyses of societal and political problems. Only Israel, Turkey, and perhaps the United Arab Emirates possess sufficient freedom of speech and of the press both to pursue policy-relevant research and to publicize it. And even then, in the Middle East, freedom to criticize government policies is a uniquely Israeli phenomenon. never seem to have the same level of success or influence as in the States. There's no AEI here; it just doesn't exist. The Shalem Center, maybe, comes closest, but it's sort of amazing how divorced from Israeli reality it is sometimes. What Hampers Israeli Think Tanks? Much of the reason for the Israeli think tank sector's weak influence lies in Israel's political structure. Like parliaments in many European states, Israel's Knesset offers fewer points of access for outside policy advice than does either the U.S. Congress or the executive branch. James McGann, a Foreign Policy Research Institute senior fellow and director of its Think Tanks and Civil Societies Program, explains, "In the parliamentary model, the legislative and executive are fused. In the U.S. model, you can go through the legislative branch or to the executive branch [with policy advice]; you do not have to go to a single source." In addition, U.S. federalism results in weak political parties. The "decentralized, porous system, with a separation of powers between federal, state, and local levels … provides yet another access point to influence federal policy," says McGann. Conversely, parliamentary systems engender greater party discipline, dissuading legislators from looking to the outside for policy suggestions or taking positions contrary to their party leadership. In addition, Israel's proportional electoral system discourages the election of officials interested in new, independent policy ideas. Proportional representation allows special interest political parties, such as the Shas party and the Pensioners of Israel party, to hold sway over mainstream parties by joining any coalition that will support pet projects. Such a phenomenon tends to deter intelligent and creative thinkers from running for office, discourages the creation of policy to solve mainstream problems, and leads to inorganic party coalitions uninterested in tackling the most important issues. In this environment, where politics is dominated by strong parties advancing narrow interests, think tanks and outside policy experts have little entrée. the great strategic decisions are made without the level of public debate that Americans might expect. For example, there was little public discussion about the merits of the withdrawal from Gaza. It was more like [Prime Minister Ariel] Sharon did it—then the public debate occurred accompanied by an aura of futility. Funding also limits the influence of Israeli institutes in comparison to their American counterparts. Faisal Azaiza, head of the Jewish-Arab Center at Haifa University, explains, "Of course I would be happy if I had money to establish a team of think tanks in education, health, and social welfare that puts statements on the tables of the government policymakers. But I'm not there yet." Gabriel Motzkin, director of the 50-year-old Van Leer Jerusalem Institute, Israel's oldest think tank, says, "We have one of the largest endowments, about a $6.5 million budget per year, which is a lot of money in Israel." It is miniscule, however, compared to the annual budgets of its American counterparts, such as the Rand Corporation ($250 million) or the Brookings Institution ($61 million). Israel offers few internal sources of money. Unlike the U.S. government and major U.S. corporations, neither the Israeli government nor Israeli businesses contract think tanks to carry out specific research, nor do they provide grants in fulfillment of public diplomacy projects that the civil and foreign service is unable or unwilling to conduct. Nor are there major Israeli foundations equivalent in resources to the Smith-Richardson Foundation or the Ford Foundation. Lastly, the Israeli tax code does not provide incentives for giving to nonprofit research organizations. McGann notes, "In the U.S., nonprofits—whatever income they have, they are not taxed on it." This, combined with the tax breaks available for donors to all sorts of nonprofits, encourages giving by Americans. Other governments also do not provide incentives for giving. The Russian government, for example, taxes donors for their gifts to independent research institutes, and then taxes the recipient when the money is received. The Israeli government does not fear independent research, but the tax code does not encourage it. Balint puts it succinctly: "There is no state funding in Israel; it's all private. And Israelis are not in the habit of donating to such institutions, in the way that Americans do." Additionally, the perceived lack of influence that Israeli think tanks have over policy further discourages Israelis from making donations. American donors, therefore, become very important for Israeli centers. Roger Hertog, an important major backer of the Manhattan Institute and a trustee of the American Enterprise Institute, is a major supporter of Shalem. American billionaire Sheldon Adelson is also a major donor of Shalem, last year granting the center $4.5 million to fund its Institute for Strategic Studies. Because they lack funding, think tanks often choose university affiliation over independence. This in turn leads research institutions either to rely on university faculty or to tailor their work and their output to an academic rather than a policy audience. Relative to U.S. think tanks, this greater academic focus is evident in the Israeli think tanks' emphasis on publishing books. Some 800 books are produced annually by Middle East think tanks, compared to about 540 produced in North American centers. "There's nothing wrong with books, but policymakers don't read them," McGann writes. "Why are you producing them? Only one major explanation: There's an academic orientation." Motzkin acknowledges Van Leer's academic focus: "We're not only interested in policy papers. We're interested in the link, the interface between theory and practice: how theory can play out practically, and how practice can play out theoretically." Even privately-funded Israeli think tanks gear their work toward academe. Motzkin says that because most funding for think tanks is short-term, Israeli scholars cannot fully break with universities because they may again need the stability the institutions provide. This leads experts to worry more about pleasing university department heads than about pleasing politicians. The temporary nature of funding as well as the danger of immediate crisis also leads Israeli think tanks to focus on the short-term and on specific projects. Such short-term work, McGann argues, "may make impossible the ability to look at problems in an interdisciplinary or long-term fashion. Institutions, therefore, are structured to respond to immediate concerns but not so driven by long-term. But they must be both to be effective." So, for example, an Israeli think tank analyzing educational policies may be pressured to collect data for a briefer period of time, from fewer sources, and evaluate it using less comprehensive techniques than an equivalent U.S. center. U.S. think tanks, in contrast, thrive on the luxury of being able to remove themselves from day-to-day debates in order to examine long-term strategy in a way that government officials often cannot. Israeli think tanks' academic orientation limits their impact on policymakers in another way. When think tank scholars receive university salaries, it limits the extent to which they can take politically contentious or partisan positions. "Because they're related to universities," Zisser says, "they have no clear agenda." In other words, university affiliation curtails work deemed controversial or partisan, and this in turn can make the output from academic think tanks less useful to policymakers. The same trend is certainly present in many U.S. university think tanks and institutes, with the notable exception of Stanford University, perhaps because the Hoover Institution maintains a higher degree of autonomy. The relevance of Israeli university-linked think tanks also suffers from their political slant. Like their U.S. counterparts, most Israeli universities lean toward the left of the political spectrum. "It's not declared," Zisser says, "it's simply that individuals, if you gather them together, are to the left." In the United States, many think tanks evolved to address hot-button issues without the constraints of stifling peer-review or the underlying assumptions and political correctness so prevalent at universities. Accordingly, while universities drift leftward, the most prominent U.S. think tanks are centrist or lean right and, in either case, fall far to the right of where most university humanities and social science professors operate. In Israel, there is a parallel tendency for independent think tanks to balance the leftist leanings of academic centers although many of the non-university-based think tanks in the Jewish state are younger and, therefore, have not developed the reputation that can bolster influence. Finally, Israeli think tanks—like many European counterparts—are less influential than American institutes because they are not pipelines for government officials. Many U.S. think tanks act as holding places for people who have ambitions to get into government or are waiting to go back, something much rarer in Israel, where few political appointments are made. Nir Boms, based in Israel and vice president of the Center for Freedom in the Middle East, in Washington, D.C., points out, "We [in Israel] don't have so many political appointments to begin with." And there is much less turnover with new administrations. Barry Rubin contrasted careers in American think tanks where the "U.S. secretary of state of a new administration has at least 120 top appointments to make" with Israeli institutes, largely staffed by "long-serving pros" who are "not waiting to go into government." There are exceptions, as Motzkin notes: "Shalem has General Ya`alon: He finished a term, went to a research center to wait it out till next election—that's if the Right wins." Such a trend works both ways. Many U.S. think tanks are so influential—at least compared with university centers—because the constant influx of Ph.D.s with policy experience sharpens and refines debates. American policymakers tend not to take university professors seriously—even those who become frequent mainstream commentators—because their lack of policy realism and understanding of how decisions are made undercuts the utility of their work. On a deeper level, the reason Israeli think tanks have less pull with politicians than do U.S. institutes reflects wider cultural norms about how people interact and how business is conducted. For example, Israeli scholars arguably do not need to work through think tanks to interject ideas into public debate because Israeli politicians are far more accessible. Israel is roughly the size of New Jersey. The government is correspondingly small, and people tend to know each other in a network of personal ties with fewer layers of staff between outside advisors and top officials. "You can get access at the highest level, which would be impossible in the U.S. In the U.S., people just like to pretend that they're getting high-level attention," said the director of an Israeli think tank who preferred to remain anonymous. One former Shalem Center researcher observes, "Because Israel is a small country, it tends to be more single-man operations than an AEI or the Hudson Institute, which are much larger than the people who lead them. They serve the organization rather than the other way around. Shalem exists for Yoram Hazony [the center's founder and provost]—it is not imaginable without him. You wouldn't say the same about American ones: It's not like [AEI president] Chris DeMuth has this incredibly charismatic profile." Israel's culture of informality is another reason that government officials seek advice from personal acquaintances rather than from institutes. This informality is due not only to Israel's size but also to its youth, its socialist and idealistic roots, and its universal army service. An early example of this ad hoc informality was Prime Minister Golda Meir's famous "Kitchen Cabinet," which made major decisions in Meir's kitchen over coffee and cigarettes, says Dov Waxman, associate professor of political science at Baruch College and formerly a visiting fellow at both the Dayan Center and the BESA Center. To an American, the idea that top officials can address audiences on state occasions without a tie and jacket would be unheard of, but this is still representative of Israel's more casual aesthetic. The reliance on personal relationships for exchanging policy information and advice is reinforced by universal service in the Israel Defense Forces (IDF), which creates a network of personal and professional relationships. Many of the scholars employed in national security policy at think tanks were high-ranking members of the IDF. Top officials who would not consult think tank material may, nevertheless, feel comfortable placing a call to an old army buddy. Most people doing military thinking are career army people. Intel services have always had in-house people taking some of the role of the think tanks. The Israeli government really wants to know how advanced Iran's development program is: A think tank won't know. the nature of political leadership is changing all the time. In the future, it will be a much more educated group—it already is. A whole generation came out of the army with only an informal education; now the Knesset is full of people with a high level of education. To the degree that this continues, the new guys will be much more comfortable with think tanks than guys who grew up with tomatoes on a kibbutz. Zisser speaks for a growing consensus that there is "a lacuna, a need." For example, many think tank directors agreed that one of the most potent functions a think tank can serve is as a "safe" place for opposing parties to meet and discuss policy outside of an official government setting. Take Israel's strained relationship with her Arab neighbors: The past decades have witnessed a history of tenuous cease-fires, treaties, and discussions of peace with diplomacy conducted under pressure from citizens' intense emotions and in the eyes of the world. Think tanks also offer a more private, unofficial place for independent scholars, politicians, and others to meet and consider alternate solutions to long entrenched problems. Motzkin comments, "Israel is strewn with ideas that are never implemented because of a political deadlock between the Right and Left." Particularly paralyzing, according to Motzkin, "are issues of religion that no one wants to touch with a 30-foot pole. That's why there's no constitution, because they don't want to figure out the relationship between religion and state." If more think tanks had an independent funding source separate from universities, they could enable more open and lively political discussion on some of the many deadlocked battles within Israel over domestic and foreign policy. Meanwhile, Israel's place in the global high-tech industry is eroding the informality that characterizes Israeli culture. Israel is adopting Western and American norms. This is visible in the business culture where Western-style punctuality and ceremony are now emphasized. Israeli think tanks now adopt the aesthetic of prestige that marks their American counterparts with features such as showy conferences. At the moment, arguably the most influential think tank event in Israel is the Herzliya Conference, hosted annually by the Interdisciplinary Center and sponsored by the Institute for Policy and Strategy at The Lauder School of Government, Diplomacy, and Strategy. Balint notes that "the Herzliya Conference does have a large effect: It draws political officials and visitors. They had Mitt Romney this year, everyone from Natan Sharansky to Uzi Ayalon. That does have an effect in terms of shaping strategic studies. People fight over slots at Herzliya." Boms agrees: "Herzliya in many ways put themselves on the map. They work an entire year for one conference. It's no coincidence that Sharon eventually gave his speech about disengagement [from Gaza] at the conference." The conference started in 2000 but already its prominence has increased. There is no guarantee that the impact of Israeli think tanks will continue to expand. After all, McGann points out, Hong Kong has seemed on the verge of producing many significant think tanks for over a decade without their actual appearance. But Motzkin speaks for many observers when he concludes: "Yes, I think there will be fundamental changes: We are on the eve." Israel will probably continue to be confronted with more than its share of crises and tensions. But better researched and developed policies, informed by more varied sectors of society, would improve the country's decision-making. Hannah Elka Meyers is pursuing a master of arts in international relations at Yale University. She has worked at the Hudson Institute and the Jerusalem Center for Public Affairs. James McGann, "2007 Survey of Think Tanks: A Summary Report," Think Tanks and Civil Societies Program, Foreign Policy Research Institute, Phila., Aug. 2007. James A. Baker III and Lee H. Hamilton, "The Iraq Study Group Report," Dec. 6, 2006; Frederick W. Kagan, "Choosing Victory: A Plan for Success in Iraq," American Enterprise Institute, Washington, D.C., Jan. 5, 2007. "Congress Supports Institute of Peace Headquarters Project with $100 Million Appropriation," news release, U.S. Institute of Peace, Washington, D.C., Dec. 8, 2004. McGann, "2007 Survey of Think Tanks." Author telephone interview with Benjamin Balint, Jan. 28, 2008. Author telephone interview with Eyal Zisser, Feb. 24, 2008. Author telephone interview with Efraim Inbar, Feb. 10, 2008. Balint telephone interview, Jan. 28, 2008. Author telephone interview with Barry Rubin, Feb. 3, 2008. James McGann, "Development of Think Tanks and Their Role as Catalysts for Ideas and Actions in the U.S. Political System," briefing, Foreign Press Center, Washington, D.C., Feb. 28, 2006. James McGann, Stephen Boucher, and Morgan Lahrant, "Think Tanks in Europe and US: Converging or Diverging?" seminar, Notre Europe, Etudes and Recherches, Paris, Dec. 13, 2004. Amotz Asa-El, "Israel's Electoral Complex," Azure, Winter 2008. Author telephone interview with James McGann, Feb. 19, 2008. Author telephone interview with Faisal Azaiza, Mar. 6, 2008. RAND 2006 Annual Report, Steve Baeck, ed. (Arlington, Va.: RAND Corporation, 2006), accessed Oct. 8, 2008. Brookings Institution 2007 Annual Report (Washington, D.C.: Brookings Institution, 2007), p. 38. McGann, "Think Tanks and Their Role as Catalysts." Manhattan Institute Board of Trustees, accessed Oct. 14, 2008; American Enterprise Institute Board of Trustees, accessed Oct. 14, 2008. "$4.5 Million Gift Establishes Adelson Institute for Strategic Studies at the Shalem Center in Jerusalem," Shalem Center, Jerusalem, Apr. 29, 2007; Connie Bruck, "The Brass Ring,"The New Yorker, June 30, 2008. Author telephone interview with Gabriel Motzkin, Feb. 19, 2008. McGann telephone interview, Feb. 19, 2008. Motzkin telephone interview, Feb. 19, 2008. Author telephone interview with Nir Boms, Feb. 11, 2008. Rubin telephone interview, Feb. 3, 2008. Author telephone interview with a former Shalem Center researcher, Jan. 30, 2008. Author interview with Dov Waxman, New York, Feb. 19, 2008. James McGann, "2007 Global Survey of Think Tanks Fact Sheet," The Global "Go-To Think Tanks," Think Tanks and Civil Societies Program, Foreign Policy Research Institute, Phila., p. 6. Related Topics: Israel & Zionism | Winter 2009 MEQ receive the latest by email: subscribe to the free mef mailing list This text may be reposted or forwarded so long as it is presented as an integral whole with complete and accurate information provided about its author, date, place of publication, and original URL.